He might be a primary protector of New York City, but at heart, Peter Parker is still just a teenager. And what do most teenagers do these days? NOTHING, THAT'S WHAT. They like to "chill" with their "Pokemon Go"s and their digital watches and such. Tch. In our day we.... Sorry, got off track there. Here's Peter having a restful moment on the new Spider-Man: Homecoming poster. 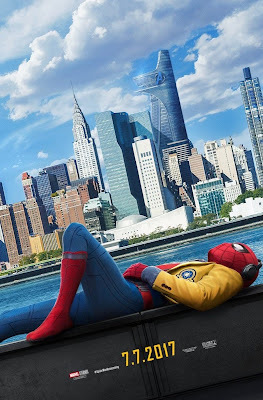 Peter here, of course is played by Tom Holland (but not that one, or that one), a teen hero living the dream of fighting crime thanks to superpowers, who nevertheless still has to balance the concerns of school work, relationships and working out his place in a world where the Avengers exist. Oh, and the small matter of a deadly new villain in the shape of Michael Keaton's Adrian Toomes, AKA The Vulture. Jon Watts is in the director's chair, while the cast also includes Zendaya, Jacob Batalon, Laura Harrier, and Tony Revolori, with Marisa Tomei back as Peter's Aunt May and Robert Downey Jr. helping out as Tony "Iron Man" Stark.